Take a free class, training is the best research! It is important that people who are interested in training in Krav Maga research schools and instructors. Once you join, Gi pants, a Rhon Mizrachi Krav Maga T shirt and groin protection for men are mandatory attire. These are available for purchase at the NYC school. Wresting shoes are strongly recommended. experience is not necessary and there is no fitness level required. Individual training and group seminars are available, please email contact@kravmagafederation.com for information. Any class listed as WHITE BELT or ALL LEVELS (above) is for beginners. To begin training with us choose any beginner class, follow the instructions listed above the class schedule and come in. No reservation is required. Krav Maga founder Imi Lichtenfeld determined that Krav Maga, like more traditional arts, would utilize a belted system, whereby students test for higher ranks. Beginner material, especially striking, is the foundation of the entire art. Students must be proficient in this material; having a strong base in the fundamentals will ensure a smooth transition to the next belt. This is particularly important when training in weapon defenses and when sparring is involved. 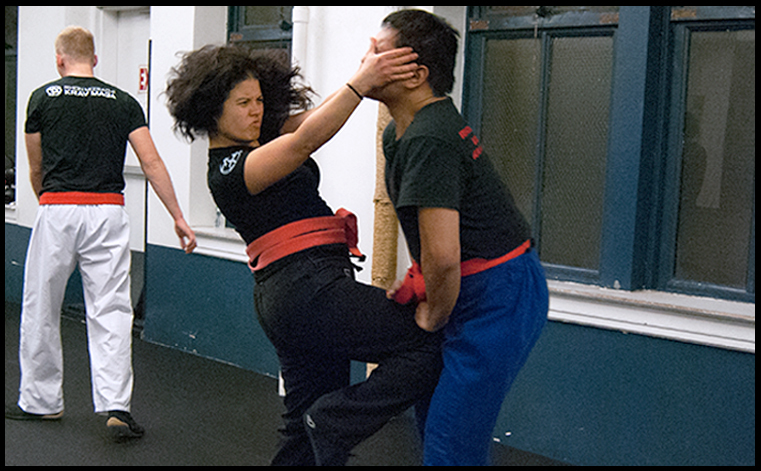 The art of Krav Maga can be divided into 3 broad categories. These are combatives (strikes), self defense techniques, and specific techniques for law enforcement and military use. At the highest ranks the material taught includes the military applications. Military techniques make up a small portion of the art of Krav Maga. Requirements of students include arriving on time, wearing proper attire, following directions and respecting their instructor and training partner. Students train to learn Krav Maga, no one is training to get hurt. As martial artists we respect all arts and believe in cross training. Having a background in Ju Jitsu or MMA or Karate, however, is not the same as Krav Maga training at Rhon’s school. Therefore, everyone starts as a beginner. While there is a basic framework in which students move up in rank, the time it takes is based on the individual student and how committed he or she is to training. Everyone progresses at a different pace and students are not compared to the person next to them. Having natural athletic ability or talent is helpful, but talent alone is never enough to excel at anything, including Krav Maga. Only dedicated training and hard work create exceptional practitioners, regardless of their “natural” physical ability. The only way to become great is to put in the work, there aren’t any short cuts or excuses. Fitness matters, but not being in shape is no reason to think you can’t begin to train. The body that you have today is the body that you’d have to use if you needed to defend yourself today. Fitness is important but this is not a gym, “cardio classes” are not taught here. If one is not trained there is no question that in a street fight one will get seriously injured. The ART is designed for everyone to learn. Training with us may not be. No one is handed an undeserved rank, and we expect the best from every student specific to that individual’s ability. Our instructors are dedicated to teaching the proper art, and students who train with us are dedicated to developing the expertise and skills necessary to protect themselves in any violent situation. In a street fight attackers don’t “fight fair” – neither does a woman who’s a trained Krav Maga practitioner. It’s a choice, to be able to defend yourself or not. Women who train with the Krav Maga Federation choose to be trained. Based on the understanding that any attacker will be larger and stronger than the victim, not using power against power is a fundamental concept of Krav Maga. Krav Maga techniques teach strikes to vulnerable targets (any place on the body that can not be strengthened but can be easily damaged i.e. throat, eyes and groin) and that for every defensive technique there must be an immediate strike. Defense and offense must be combined. The art teaches strikes which utilize the parts of the body that are best used as weapons. These are kicks, elbows, knees, punches and what are termed “other punches”. Krav Maga is the perfect martial art for women. The concepts that we follow ensure that smaller individuals are capable of effectively defending themselves in an attack. For women, it is important to understand that when strength matters it is in focusing the strength that exists into the actual strike used. A proper kick to the groin is a serious weapon regardless of the woman’s size (or the size of the attacker), or that a poke in the eye causes an attacker to shut his eyes, therefore giving time to remove oneself from the attack or continue to strike. For individuals who are not trained, there sometimes exists the concern that when confronted by an attacker the victim will freeze. Fear is a natural response that triggers the “fight or flight” instinct; everyone is afraid. Being trained how to respond does not mean that the fear is gone. It simply means that it is put aside, and that through having the ability to defend oneself fear will not dictate the response of the defender. No matter how fit or strong you are, training in Krav Maga will teach you how to effectively defend yourself. Training will get you into shape. Fitness matters in general, but not being in shape is no reason to think you can’t learn. The body that you have today is the body that you’d have to use if you needed to defend yourself today. Krav Maga will teach you the tools to use to defend yourself; you adapt to the situation and use whichever work. As far as the assailant is concerned, it doesn’t matter if you hit him with an elbow or a punch or a kick or a brick. As long as the strike caused injury it was the right tool. Students at this school train with the understanding that one strike is never enough, we continue to strike until the threat is gone. Training under Rhon Mizrachi and his instructors means we learn not only how to fight but also how to think about what it means to defend ourselves – we learn that the brain is the most important weapon that we have. I started training after being followed in a parking lot late at night by a white van. I managed to make it to my car and drive away, but I had never been so scared in my life. I never wanted to feel that helpless again, so the next day I Googled “self-defense classes” and found KMF. After my first class I knew it was exactly what I was looking for. It’s not a school of gimmicky aerobics classes. KMF is the real deal. You learn the proper techniques to defend yourself, no matter your size. No one else in the country understands the art of Krav Maga like Rhon Mizrachi, and no one cares more about preserving the traditions and techniques of the art like Rhon and his instructors. I’ve been training for almost 5 years, and I can honestly say that KMF has become a second family to me. I walk down the street with confidence, knowing that I can defend myself in any situation if the need arises. During the hour long class they are tough, but let’s face it, they are taking on the responsibility of getting us out alive if it came down to a life or death situation – how would you want them to be? As tough as they are on the mat, they are extremely kind, patient, approachable and always willing to answer a question, or show you that one specific move for the millionth time (I say this from personal experience). My love for the school is not only about learning how to defend myself. It is not only about walking down the streets with a confidence and attitude I have never felt before. It is also about having a second family. I walk into a place where I am happy to see everyone and making the kind of friends I spend holidays and vacations with. Really, it is about walking up the 3 flights of stairs after a long day and feeling like I can finally exhale. I walked into the Krav Maga Federation 5 years ago at age 51 having never thrown a punch or been in a physical fight. Master Rhon and all of the instructors have given me a foundation and a set of tools and a mindset to use just in case…I feel more confident and better prepared due to the training I received. I walk taller and think smarter. I only wish I had known about this school so many years ago or that this training, which is so naturally intuitive to the body, was available when I was young and could have learned so much quicker. I know I am not the same person I was years ago when I took my first class. The confidence of knowing I am prepared to deal with a confrontation gives me the confidence to walk away from one. The first time I got on the mat to take class with Rhon Mizrachi was about a year or so after I had my baby. I had no idea that it would change my life. I wanted to get back into shape and relieve stress but I was not interested in a fad, I wanted to learn something real. I liked the idea of Krav Maga because it was both body comprehensive and taught principles rooted in day-to-day life. I did my research and saw that KMF was the only authentic place to train. The class was engaging and moved fast. I was immediately hooked. Every time I came back, I learned something new. Krav Maga is for self-defense, but what I learn from Rhon and his rigorously trained instructors is so much more then basic technique. The skills that get sharpened on the mat inform my life beyond the mat. The influence has been so great that as soon as my daughter turned six years old, I brought her to train at the school. She’s eleven now, still training twice a week and loving it. I’m not expecting her to take down a 220 lb. man (yet) but I strongly believe that she has a life advantage now. Training has enhanced her ability to move through the world with confidence. She is present, aware, calm and consistent — all the key elements for making good choices – which, as a parent, is the only true protection we can provide. The other big thing for me was that there is no set timetable for her to graduate to the next belt. This is the same for the adults that train here. She doesn’t automatically get a new level belt just for training six months. This is huge because it underscores the importance of truly earning an accomplishment. This also has a safety aspect that speaks to the larger nature of the school. It means that she does not get thrown into a situation beyond her depth or get bored. It is crucial to me that she understands that the road does not rise to meet her; her confidence is built every time she faces down the challenges of earning her belt. I am so grateful she is able to do this in a conscious, contained environment. I joined the Krav Maga Federation in 2010 to enhance my boxing training which I felt was lacking. With little familiarity, what I found was a practical in nature martial art that challenged me and to which I quickly devoted all of my training. While the art of Krav Maga is compelling on its own, my commitment is due in no small part to Master Instructor Rhon Mizrachi, the entire instructor staff, and the community of students at the Federation. I have always felt supported in my training and through my advancement in Krav Maga, which is of utmost importance, in particular to women practicing in the martial art community. After exploring my own interest in the art and having trained Krav Maga at other institutions and in Israel, there is without a doubt, no other master that can match the highest level of expertise of Rhon Mizrachi. He truly is the foremost authority on Krav Maga and under his tutelage, the instructor staff practices and teaches with unparalleled skill, knowledge and dedication to the true art of Krav Maga. There is no better experience than training under Rhon Mizrachi- No other school can ever teach the heart and soul of the Krav Maga art than Rhon- best investment I ever made- not to mention the fact that I’ve never been in better shape! – Will I look great? – Will I be able to protect myself? What better than a place that protects you first, by actually teaching basics on properly closing your fist before all else, when throwing a punch? Read above on throwing a punch first. I cringe when visiting schools that put a premium on hand wraps and fail to mention that thumbs should be on the outside when making a fist. But also, I can hear Rhon again: “If you can’t level him, he’ll take the knife back from you”. Seriously, if you break your hand, you’re not taking away a knife. Find another school. Calmness was an scarce state for me, anxiousness was more the norm. I was perpetually worried since childhood and it became nearly unbearable when I began living on my own. All the what-ifs and not knowing how to be prepared was scary. I had to acquire the tools for taking control and taking care of myself. I had to stop letting the unknown crush my peace and my soul. I had to live life and I had to know how. I had to know what tools to use and how to operate them. I had to know how to optimize my chances of getting through a difficult, uncomfortable, or frightening situation. I had to know that panic and frustration are self-made obstacles. I had to know that for every action there must be a reaction and that time is so precious. I began to understand that if it is just you then you are the first responder, and to take that seriously. Keep your composure so you can quickly assess risk, act fast, and be adaptable. Be comfortable with discomfort and never forget that self preservation is always your priority. Everyone’s path to Rhon Mizrachi and the Krav Maga Federation is different. Some come as novices and some come as accomplished martial artists from other disciplines. And while we come with different experiences and expectations we stay for the same reason – the excellent instruction offered by Rhon and his instructors. My martial arts journey started more than a decade ago when I was seeking an activity for my son that would involve not just fitness but an impact on discipline and self confidence as well. 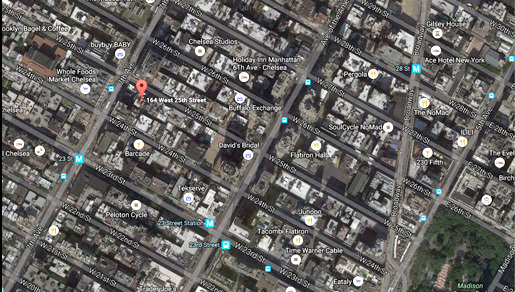 That led to our neighborhood Taekwondo school where I started training soon after my son did. I earned my black belt two years ago and will test for my second Dan later this year. As much as I enjoyed and continue to enjoy my Taekwondo practice, I felt that something was missing. Taekwondo is a sport and as such it is shaped by its scoring rules. Kicks to the head, and spinning and jumping kicks score more than do kicks to the mid section for example. And strikes by elbows and knees and those to vulnerable targets like the groin and the eyes, the most useful in self-defense situations, are not permissible at all. Yes, I could be a black belt in Taekwondo and still not be able to defend myself in a real situation. Or have confidence that I could. So I came to Rhon. Much of my general kicking and striking technique transferred easily but the Krav Maga methods for defending myself and disarming an assailant were new to me. I am continually impressed by the seriousness that Rhon and his instructors bring to the mat every day. Their attitude is that this is school, not gym time, and that students are there to learn and not simply to jump around and sweat. Accordingly, no detail is too small to address and no question is too dumb to ask. I also appreciate that as one of few middle aged women, I receive equal attention as the young and more athletic men in class. Indeed, there is a great appreciation among the instructors for the challenges specifically facing women. In the real world, we are assaulted more frequently than men and differences in size and strength are practical concerns. I know that I feel stronger and safer since I starting training with Rhon; I finally have confidence that if someone laid hands on me or someone I loved, I wouldn’t just freeze. Finally, there is real community among Krav Maga Federation students. We arrive early and stay late because we enjoy being with each other. People are kind and generous on and off the mat. And while we take beating each other up seriously, we take pains to make sure that no one actually gets hurt. For Krav Maga students, this ability is the ability to defend ourselves. Training in self defense is a great motivator for fitness. It’s not about a trainer telling you to do one final rep, it’s about you telling yourself to move faster, throw harder strikes and kick higher. The motivation is that you are getting attacked. If you are constantly making efforts to improve your ability as a martial artist then you are improving your physical condition. It is just a part of being effective at self defense. There are many ways to exercise in order to be better at exercising. 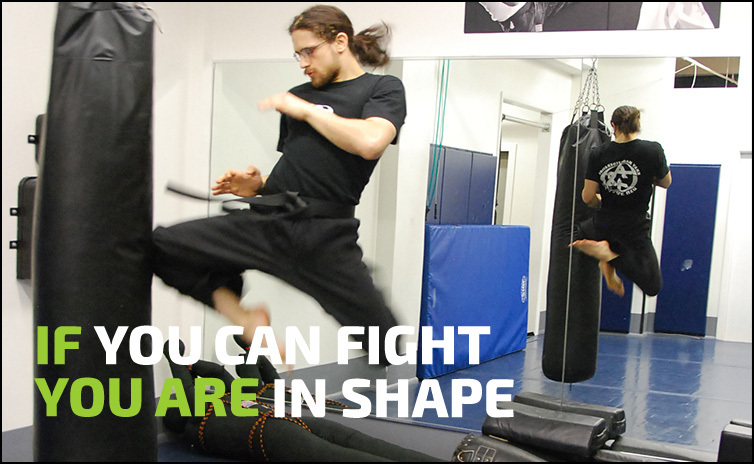 We exercise to be better at fighting. Fitness as a goal for Krav Maga practitioners includes attaining better cardio for endurance, strength for more damaging strikes and flexibility for ease of movement. There are many ways of reaching these goals. While weight training assists in strength, running assists in endurance and yoga provides flexibility, training in Krav Maga develops all three aspects of fitness specifically for fighting. Krav Maga training recognizes that individuals have different physical abilities and sometimes actual limitations. 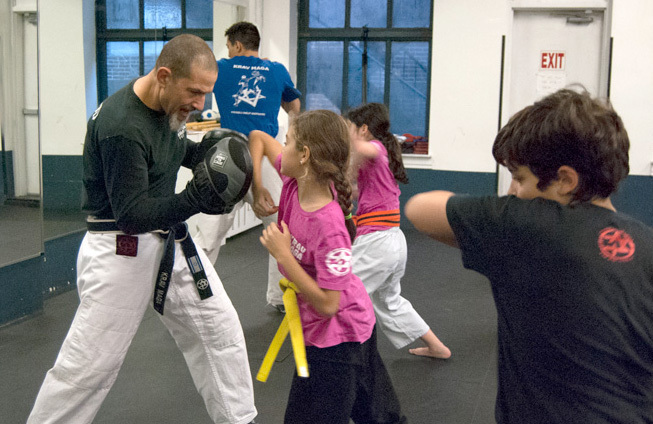 At Rhon Mizrachi’s Krav Maga NYC school, differences are respected. Students are not compared to the person next to them and each student is encouraged to maximize his or her own specific ability. An average 20 year old and 65 year old, for example, most likely do not have the same abilities and are not expected to. As we age, staying physically fit assists in preventing injuries and supports everyday health; countless studies show the correlation between exercise and longevity. Through Krav Maga training all students develop the fitness necessary for effective self defense. Exercise alone in no way prepares people for self defense. This school is not a gym. Weight training and cardio fitness classes are not offered here. Fitness matters to us, and it is through our training that we get and stay in shape. If you’re looking for the best martial art for kids, nothing else is like Krav Maga. No activity will do as much for a child’s development as participating in a martial art. Through training in Krav Maga children develop increased self-discipline, focus and self-confidence while learning to set and achieve goals. As kids train they also gain self-respect and respect for others. Confident children know they will excel in all other activities and can achieve their goals. Everything your children learn is something they could use if they were in a situation that required physically defending themselves. They are also taught to know when that is acceptable. Using Krav Maga is not acceptable unless they are in a dangerous situation. Kids classes are for children ages 5 – 12. Children are taught the same Krav Maga as adults but in an appropriate setting for kids, which includes having fun! Safely training in class is always a priority. Some of the transformations children achieve through training in Krav Maga with Rhon are amazing; Shy kids come out of their shells, kids learn to respect themselves and each other, and children who experience bullying develop the confidence to stand up for themselves. Children with ADD / ADHD excel in our classes, being able to maintain focus for longer periods of time as they continue to train. As with other arts (Tae Kwon Do and Karate being the most popular for children) Krav Maga will improve your child’s coordination, flexibility and balance. It also sets children on a healthy path in life, learning to enjoy exercise from an early age. Since bullying is a huge problem for children at such young ages, we believe that it is extremely important for children to be able to defend themselves for their physical safety as well as their emotional growth. Grand Master Rhon Mizrachi teaches the kids’ program and chose Erik Somwaru as the additional instructor. Rhon began training at the age of 7 under the founder of Krav Maga Imi Lichtenfeld, Erik at the age of 6 in Goju Ryu Karate. Because of their backgrounds they know first hand what it means to train as a child. Rhon believes in the importance of children learning self defense, the healthy physical growth and personal development of children through training in Krav Maga, as well as the importance of ethical behavior. Our school is especially unique in its strong sense of family. Every student, regardless of age, is helped to reach his or her potential. 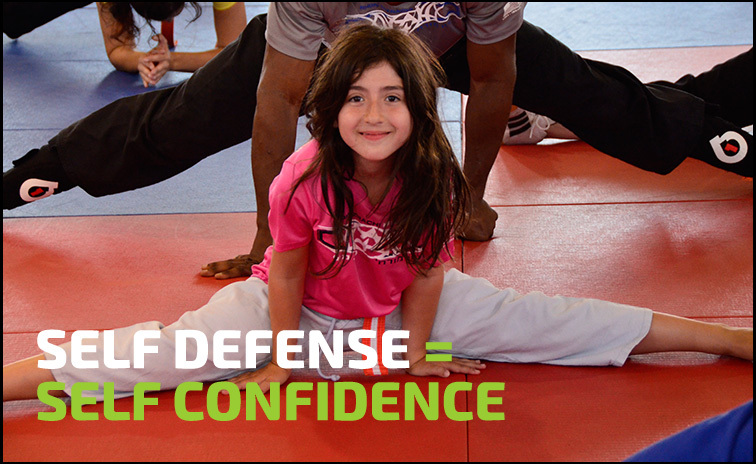 Teaching a child self defense is an important life skill; our Krav Maga classes give kids the tools to succeed. The Krav Maga kids class schedule follows the public school calendar. Classes are not held when school is closed for holidays and vacations. 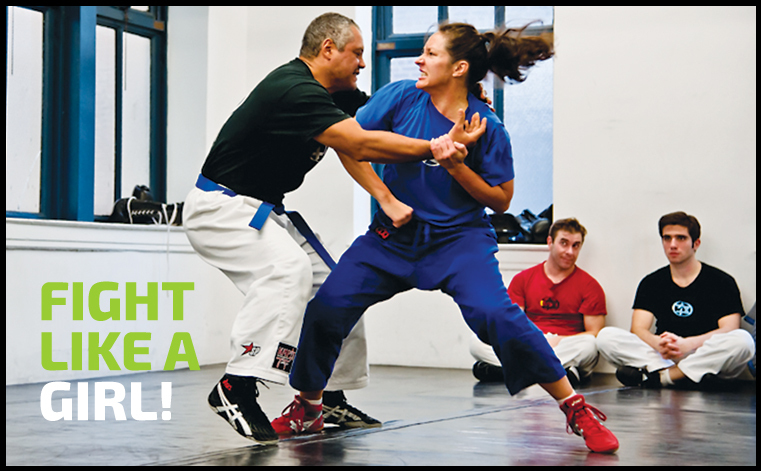 Please email us at contact@kravmagafederation.com or call 212 781-7918 for more info!